There are approximately 4 million households in the UK not connected to the network of gas pipes that help provide heat to homes and businesses. Some of 4 million households will be people living in remote locations whereas others might simply want to be more self-sufficient. If you are one these people and you live in the Dunstable, Luton or Milton Keynes areas, then get in touch with us at Absolute Plumbing and Gas Solutions to see what we can do for you. We can provide a complete oil central heating system to your home or business. We can supply and install a range of oil central heating boilers and water cylinders appropriate for your individual needs. Once installed we can also offer an aftercare service that includes an annual check of your oil boiler and any other part of your oil central heating system that requires annual maintenance. By choosing Absolute Plumbers and Gas Solutions Ltd to install oil central heating boilers, not only will you receive a first-rate professional service, but you will also be employing an OFTEC approved company. Furthermore, all of the boilers, whether heat only or combination condensing oil boilers, will be ErP compliant. 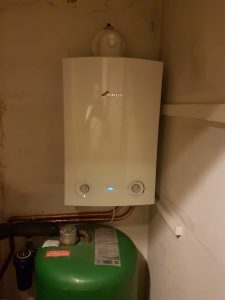 All of our team are fully qualified to install oil central heating boilers and can carry out the job in an efficient manner, causing as little mess and disruption as possible. The only thing that you will need to organise will be the purchase of the oil tank and the delivery of the heating oil. We are a family run business that has been serving the good folk of Dunstable, Luton and Milton Keynes for over 25 years. We are specialists in the industry and can advise you on the best solution for your heating needs, whether they be gas or oil. Contact us today for more information.